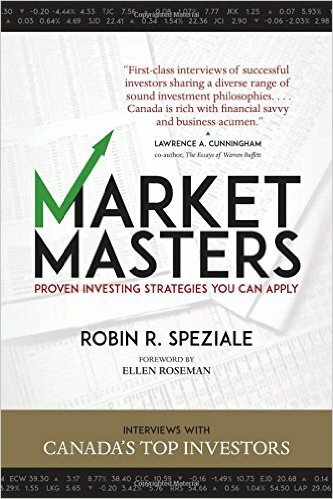 Market Masters , by Robin R. Speziale shares proven investing strategies you can apply. As you might expect, he’s a young Canadian investor pursuing financial independence. I was lucky to make Robin’s acquaintance and grateful he extended me a copy of his book to review. So what should you expect when reading Market Masters? Keep reading to find out what this do-it-yourself investing book is all about. Sound good?. Market Masters is essentially a Market Wizards style book with a Canadian twist. It consists of interviews with successful Canadian investors (and one notable American). The book is packed full of lessons that can help individual investors regardless of experience level. One of the things I liked about Market Masters, is that it covered a wide variety of investing styles. The book starts out profiling notable value investors; but from there, it moves across the spectrum of money making methodologies. While I’m not afraid to dive deep into a subject, like value investing (for example), I really enjoyed how Robin interviewed such a broad range of investors. It kept the book fresh, and I think as a reader I got more value out of learning from different specialists. In addition to value, the book contains interviews with very successful growth and fundamental investors, as well as technicians and even a trading psychologist (amongst others). I think this diverse mix of view points makes this book appealing to anyone with an interest in investing. You’ll have to buy it to see for yourself. I think my favourite part was the interview with Jason Mann from Edgehill Partners. I really like how he looked for opportunities that contained not only value, but also price momentum (and catalysts). The reason I liked this part of the book is a little bit selfish. While I’m a fundamental investor at heart, I’ve been experimenting quite a bit with adding technical overlays to my investment decision-making process. The ideas shared in this chapter really resonated with me because Jason Mann had faced some of the same challenges I did when trying to invest on a value-only basis. I appreciate his desire to figure out how to make money now, while still maintaing a fundamental edge and margin of safety. You might disagree with me about the best part of the book. But that’s okay. And that’s the point. I think anyone can probably take some of the lessons in Market Masters and apply some of the ideas to their own investing. You’ll probably appreciate hearing the struggles that the market masters have had over the years with their own investing careers. Personally, I always find it validating when I know that other successful money managers have overcome some of the same obstacles I face. As you’ve probably guessed by now, I really enjoyed reading Market Masters. 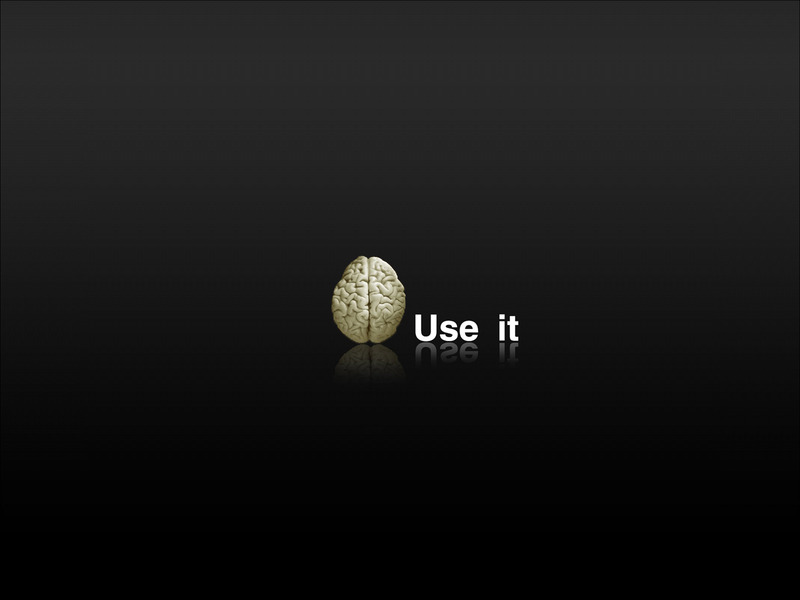 And I think you will too. For that reason, why not check it out on Amazon for yourself? That said, if you’re still loping for more information, then please watch the video book review below. 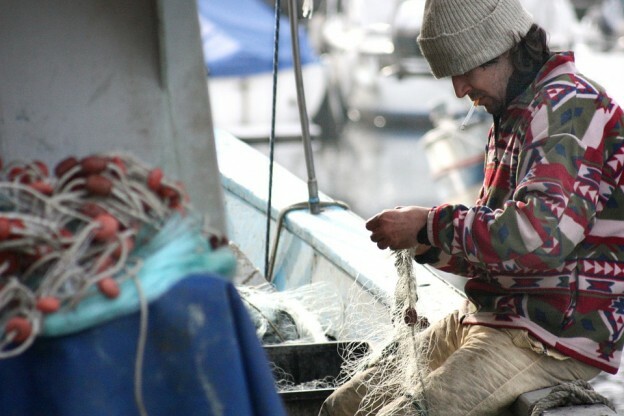 You’ll get even more information on Market Masters. And (especially if you’re Canadian) you’ll probably find that this could be a great investing book for you. This entry was posted in CFA Level 1 and tagged investment book reviews on May 4, 2016 by Jworthy. 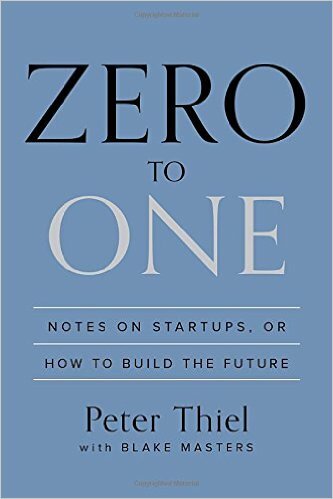 Zero to One , by Peter Thiel, is a great little book about Notes on startups, or, how to build the future. And that’s exactly why I’m so excited to review this book for you today. Although it’s not a strict investing book, Thiel’s musings are definitely rife with business insight. So for that reason, I couldn’t ignore sharing this book with you. So keep reading. Because this review is going to give you everything you need to help you decide if Zero to One is the right book for you (or your favourite entrepreneurial nephew, perhaps). Now let’s cut to the chase. Zero to One is a short and easy-to-read book that was based on Thiel’s lectures at Stanford on startups. One of his students, Blake Masters, took exceptionally good notes from the course. And that’s what led to this book. Essentially, Zero to One shares a framework for how Thiel thinks about business. Each chapter contains a different idea, most of which challenge conventional business wisdom. For example, one chapter is called “Last Mover Advantage” (in contrast to the more common first mover advantage). It’s this kind of counter-intuitive teaching that kept me from putting down Zero to One. And even though Zero to One is primarily about startups and founder-driven businesses, there’s lots you can learn as a regular self-directed investor or retail trader. The ideas in this book are sure to get you thinking. In Zero to One , Thiel argues that a lot of business resour es are spent on incremental improvement. That is, going from n, to n+1. It’s easy and accepted to make this kind of incremental change on products, projects and companies. But Zero to One emphasizes a different approach. The concept of Zer to One is about creating new things. Thiel argues that much more value is created going from nothing to something (0 to 1), vs building a new feature or improving an existing product or service (n+1). Make sense? I hadn’t thought of this concept before reading this book. But once it hit me I couldn’t shake it. And I’m glad my friend recommended this book to me. When doing these book reviews, I always like to provide a balanced view. But in the case of Zero to One, this is easier said than done. To be honest, my biggest complaint is probably that the book was too short. The reason is, I really enjoyed Peter Thiel’s thinking and simply wish that I could absorb more of it. That’s hardly a real complaint. And I’m sure there are lots more resources online, which I’m going to look into. But for now suffice it to say the book does a wonderful job introducing some great business ideas. I just wish it dove deeper into some of them. Zero to one is a really neat business book. It’s easy to read, very intriguing and does a heat job making you question conventional business wisdom. For these reasons, I recommend checking out Zero to One on Amazon. And by the way, if you still want a little bit more information, I encourage you to watch the video book review below. This will help you further determine if Zero to One is the right book for you. This entry was posted in CFA Level 1 on April 24, 2016 by Jworthy. 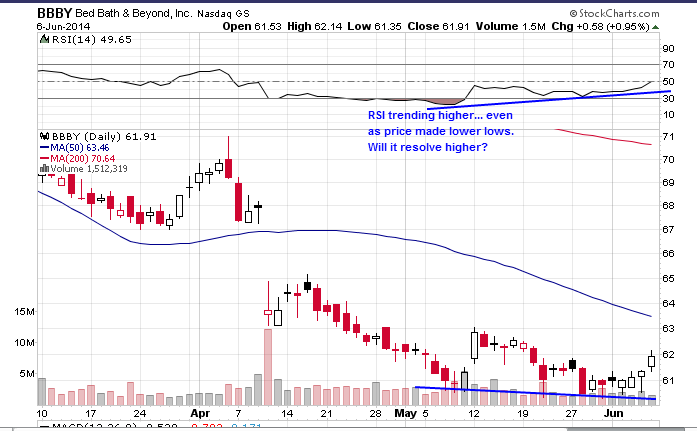 In this blog post I’ll show you some actionable RSI divergence trading examples that have stood out to me lately. 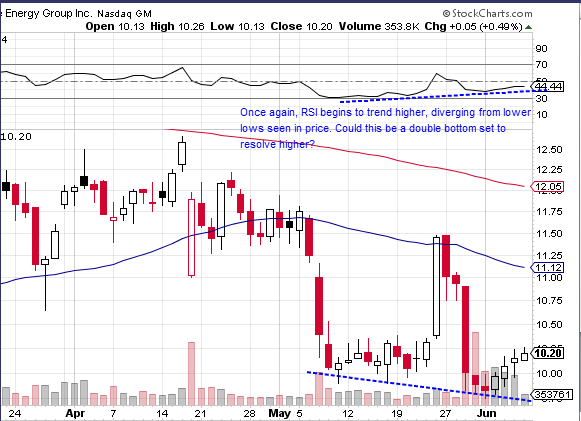 These recent and relatively current stock ideas will show you some real time examples of RSI divergences. And when you’re done reviewing the charts below you should have a much firmer grasp of how trading RSI divergences works in practice. Sound good? BBBY is a mainstream example of RSI divergences in 2014. Sometimes RSI Divergences line up with key events. 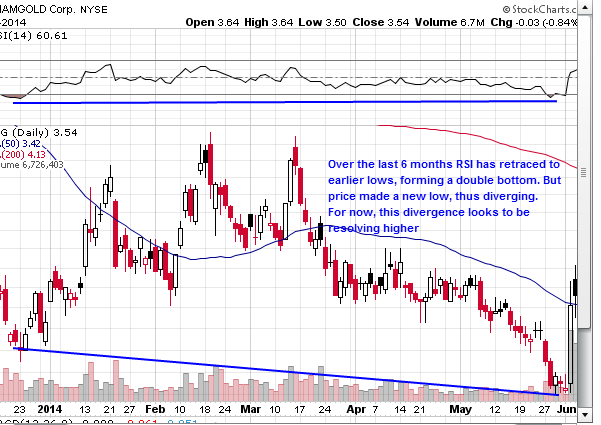 REGI is experiencing an RSI divergence while completing a controversial acquisition. IAG might be an example of a longer-term RSI divergence in 2014. Just like the above positive RSI divergences show stocks that are potentially bottoming, a negative divergence can also indicate a potential top in either a particular stock, or even a market index like the S&P-500 or Nasdaq. Make sense? Do you have any RSI divergence trading examples to share? This entry was posted in CFA Level 1 and tagged RSI divergence on June 8, 2014 by Jworthy. CFA Level 1 Ethics Learning Outcomes are important to focus on when studying for your CFA Level 1 exam. That’s because while the ethics study session is pretty short, it carries a big weight on the CFA exam, worth 15% of the exam. By the way, you can also review all of the CFA Level 1 study topics here. Keep in mind these notes are not from the CFA curriculum, but actually from the Kaplan Schweser CFA Level 1 study guides . I really like these guides because they are quite concise and focus in on exactly what you need to know. The Ethics and Professional Standards are covered in Book 1, Session 1 – Pages 1-98 of the Kaplan Schweser study guide linked to above. 1a: Describe the structure of the CFA Institute Professional Conduct Program and the process for the enforcement of the Code and Standards. 1b: State the six components of the Code of Ethics and the seven Standards of Professional Conduct. 1c: Explain the ethical responsibilities required by the Code and Standards, including the multiple sub-sections of each Standard. 2a: Demonstrate and explain the application of the Code of Ethics and Standards of Professional Conduct to situations involving issues of professional integrity. 2b: Distinguish between conduct that conforms to the Code and Standards and conduct that violates the Code and Standards. 2c: Recommend practices and procedures designed to prevent violations of the Code of Ethics and Standards of Professional Conduct. 3a: Explain why the GIPS standards were created, what parties the GIPS standards apply to, and who is served by the standards. 3b: Explain the construction and purpose of composites in performance reporting. 3c: Explain the requirements for verification. 4a: Describe the key features of the GIPS standards and the fundamentals of compliance. 4b: Describe the scope of the GIPS standards with respect to an investment firm’s definition and historical performance record. 4c: Explain how the GIPS standards are implemented in countries with existing standards for performance reporting and describe the appropriate response when the GIPS standards and local regulations conflict. 4d: Describe the nine major sections of the GIPS standards. So there you have it. Hopefully these learning outcomes will help you improve your studying for the CFA Level 1 exam. 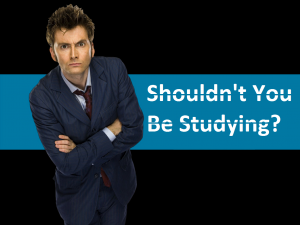 If you’re contemplating studying the CFA level 1 exam I encourage you to check out the Kaplan Schweser CFA Level 1 study guides yourself to speed up your studying and improve your results. And By The Way: If you’re not ready for the CFA exam you can still improve your approach to stock markets by downloading my free ebook below. You’ll learn how I have refined my approach to the stock market over the years. You’ll also get free updates, tools and tips sent to you each week with my favorite stock market resources. 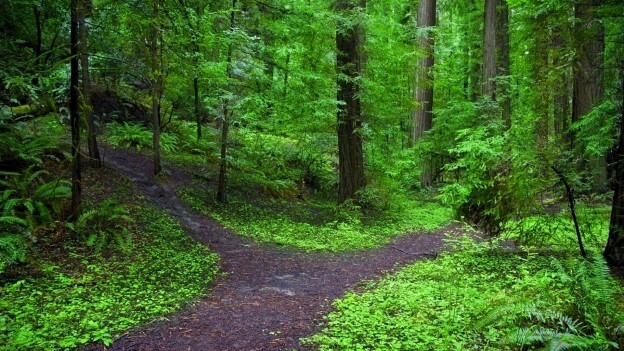 This entry was posted in CFA Level 1 and tagged CFA Ethics on March 30, 2014 by Jworthy. So what does this difficult exam encompass? As you can see there are quite a lot of topics in the CFA Level 1 curriculum. There are thousands of pages of reading and over 550 learning outcomes! The CFA is no easy undertaking but being a charter holder is a great way to validate your knowledge of financial analysis. In addition to the above level 1 exam weights, there are another of other helpful online resources to help you prepare for the CFA Level 1 exam topics. AnalystForums.com has a lot of great resources to help you get up to speed with CFA Level 1 study topics. Check out the CFA Level 1 Forum to get in on the conversation and start learning from other CFA Level 1 students who are studying as well. There’s also a good discussion thread on CFA study strategy you might enjoy reading. The CFA institute also provides an in-depth Candidate Body of Resources (PDF). This document will give you a working summary of all the main areas of the exam. I recommend giving it a read before you get started studying the CFA Level 1 topics. And while you’ll probably want to get your own copy of the CFA study guides and textbooks, Investopedia has a great CFA Level 1 study guide. If you’re having trouble deciding if studying the CFA Level 1 exam is right for you then check out this free guide to see if the study topics are of interest to you. The CFA is a difficult qualification to achieve, requiring 3 exams and years of professional experience. So are you interested in studying CFA Level 1? And By The Way: If you’re not ready for the CFA but are still curious about improving your approach to stock markets, I encourage you to download my free ebook below. You’ll also get free weekly updates with my favorite tools and resources to help improve your stock trading and investing decisions. This entry was posted in CFA Level 1 and tagged CFA Level 1 Study Topics on March 24, 2014 by Jworthy.